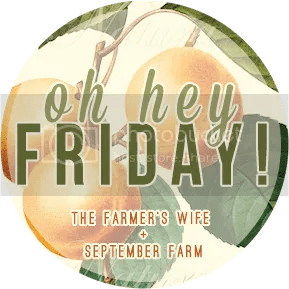 Today’s hodgepodge of information is brought to you by…FRIDAY! It’s finally fall (in my mind anyway! )…which means it’s finally football season…which means you can expect to see a lot of pictures of my little family decked out in purple. We have K-State season tickets this year, and my in-laws got a new condo in the greatest place on earth (Manhattan, Kansas–don’t you know?! ), so we’ll be spending a lot of time there this fall. I can’t wait!!! Go cats!!! This week we took a little field trip with Gigi and Papa to Cider Hill Family Orchard. None of us had been before, but it was such a darling little place. KC friends, you should definitely check it out! It was a perfect outing to kick off fall…and now I see some delicious apple crisp in my future! BUT there’s no time to be weepy…I have a campout to plan!!! Camp Nash is just a month away! While it’s been a fun week, it’s also had its fair share of drama, courtesy of a certain threenager. Let’s just say if our timeout chair could talk, it would have some stories to tell! When Arden told me that I had two choices: “1. Not putting her in timeout OR 2. Not making her share with Nash” (pretty clever, right? ), I knew I needed to tweak my discipline strategy a little. So instead of focusing on the terrible threes drama, I’m going to try rewarding all of the great things she does throughout the day–from sharing, to cleaning up, to saying please or thank you. We’re calling it Arden’s “way to go!” jar. Oh Janner…I think I speak for America when I say: we love you. Just a little tip if you use code PHOG (although that PAINS me to write) you get 30% off at Charlie Hustle! I love that one of your five is Janner!! Yes, America loves Janner and especially us here in KC! Let's start a movement – #JannertoCanyonCreek! P.S. Don't you just love how everyone around them at the game is acting completely normal and minding their own business?! Clearly I would NOT fit in in that photo because I'm pretty sure I'd be watching them and not one play of the game! Love the Jar idea! And I'm glad I'm not the only one obsessed with Janner! The jar idea is great! And the invitations for your son's birthday are so cute, such a perfect theme for a little boy birthday! Bahaha!! Janner!! I'm the same way with Kaitlyn & Shawn…a stalker. Yep. It's crazy that we're already planning first birthdays! But I'm with you, all I've done is mail invites. Charlie Hustle has a collegiate collection now?! Clearly I'll be checking that out soon. HOW are you planning a 1st birthday?! The "way to go" jar is genius. I may have to borrow that idea. Our dicipline tactics are just not working. Time out. Tanner is from KC?! What?! I'm glad you still show up every few weeks :p I always look forward to your posts! Love the theme for Nash's birthday! We're two weeks away here and I'm not ready at all. And I totally feel you on the threenager! I used to be able to count to three and she's listen 4/5 times. Now, I start counting and she counts along with me and tells me to go into time out too. I may have to try this jar! YAY! I love when you blog!!! and that jar system is AMAZING, definitely saving that for later! Friend!!! How is Nash already almost ONE! I just truly can't believe it!!!!!! He is such a doll and I think we might do a Camp Theme for Owen's 4th bday so you're going to have to share where you got that cute invite and all your super fantastic ideas. And PS-I'm totally stealing the pom pom reward jar we need to do something like that too because lately Owen's been giving a lot of the same sass, "No, Mom that is NOT a choice." When I ask him to do something. hmmmmmmm Three it certainly has it's challenges, right? !